Indrans who had been keeping his presence alive in the malayalam film industry for the past 3 decades with wide repertoire of over 200 movies in his credit is all set to enthrall the audience enacting the role of Charlie Chaplin. Known for his rail thin figure and peculiarly voice, Indrans will play the lead role in R. Sharath's Buddhan Chirikkunnu which would truly be a tribute to legendary comedian Charlie Chaplin, in the centenary year of his entry into movies. 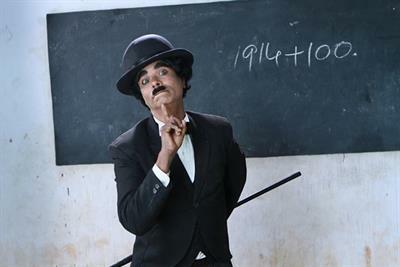 Indrans enacts as Indraguptan, a small-time actor and an ardent fan of Chaplin who tries to imitate him in his own life. Indraguptan who loses his mother at an early state leads a miserable childhood filled with loneliness. As the dreaded past haunts him throughout his life, the movie zooms into the family life of the actor too. Enamored by the maverick English icon, Indraguptan gets a chance to play the great actor's role on screen. He wears Chaplin's signature costume from the movie 'The Tramp', complete with a toothbrush moustache, baggy clothes and a bowler hat. The dilemmas and conflicts faced by Indraguptan form the crux of the movie. Indrans an adherent fan of Chaplin has watched most of his classics. He was truly excited and nervous in the initial stage of the shooting as the responsibility was on his shoulders. Scripted by the director himself, the movie is produced by Jyothi Krishnan under the banner Epic Films. Nedumudi Venu, Jagadeesh, P Balachandran, Nandu, Sudheesh, Munshi Baiju, Sharvani Jamenis, Praveena, Malavika Menon, Amritha Anil, Sona Nair, Lakshmipriya Menon have also been a part of cast. The shooting of the movie has been carried out at Kollam and Thiruvanthapuram. For the lyrics of Prabha Varma, the music is being composed by noted play back singer G Venugopal. He will also be singing a song, which has a soft melody with a bit of Hindustani touch.